Today BritainAndAmerica publishes its new masthead and its statement of underlying principles. This website does not believe in a deep relationship between the UK and USA for historical or sentimental reasons but because of vital shared interests and values. Those shared interests are summarised below and your comments on them are very welcome. The new logo is very good. The old one suggested that the site was about Britons watching America. This new design fits with the excellent set of principles. I fear democracy in the Middle East would result in disaster. Democracy unfortunately tends to result in the enlargement of the state and the reduction of freedom. "Britain and America stood togther against Nazism": balls. Britain (and the Empire) stood against Nazism, and did so through 1939, 1940 and all the way through 1941 until December, when finally the US was forced into the war by the Japanese attack and German declaration of war. FDR had countless chances to do what Wilson did and declare war himself, but not only did he fail to do so, he pledged during and after his 1940 re-election campaign that he would not (and was roundly supported for this stance by *every* poll of the American population taken). Your defence of America in the modern day world would be a lot more convincing if you didn't make up quite such absurd things about America in the past. Good luck with this initiative. Sadly, having watched Fox news and read some right-wing writers, I don't think the neo-cons feel the same way about us. "Inept Rewriting of the Past"
Many Americans were also reluctant to defend Europe 1945 onwards. But America was channeling weapons and other supplies to us in order to sustain our war effort long before they actually fired a shot, don't forget that. First, I want to congratulate Tim on outlining such a concise and powerful summary of the values that unite us. Inept, there can be no doubt that Britain would have fallen to the Nazis if not for the intervention of the United States. That said, the modern GOP does not admire FDR. As a Neoconservative, I feel optimistic that we will never again have a dictatorial, socialist, cowardly president like FDR again. Ballotboy, we were so reluctant to defend Europe that we spent hundreds of billions of dollars on the Marshall Plan, we set up NATO, we stationed hundreds of thousands of troops there, and set up nuclear missile sites there. No wonder why you doubt the Neoconservative commitment to a strong UK--you've been fed so much misinformation and propaganda, you probably don't even know what a Neoconservative is. I think they're honorable objectives Tim, coming from a man I have very high regard. I would like to caution against one big temptation: I agree with our commitment in Iraq for what I believe are crucial objectives but we in America cannot and should not play world cop. I know you didn't say we should but sometimes that line is difficult to define. Concerning our involvement in WWII and its aftermath commitments, statements here describe it as if 'we really did not care,' being indifferent to the suffering and injustice. Well after WWI ('the war which was to end all wars') this country saw many of its young men dead and horribly maimed from a nightmare started on the other side of the world. A much, much bigger world than today. A part of the world who's history was one seemingly of endless wars and disputes of conquering and revenge. It was still fresh in the minds of a many here who wanted nothing further to do with 'your' insanity. We paid a huge price and for what? Also, Roosevelt was a politician in his 'pledge.' Its fortunate he's the one who was elected, he was not an isolationist. He wanted our involvement earlier but did not have a willing majority to work with. And as JF pointed out, as far as our commitment to a very uncertain future post-WWII devastated land... how anyone in modern day Europe find's fault is beyond me. The generation in the immediate aftermath certainly didn't. But that was a different people than today. Lets get one thing straight - there were many in both the State Department and Congress who were reluctant to support the Marshall Plan and Truman had to work hard to sell the Plan and his Doctrine to the US public. It is not propaganda, but History - try reading some from time to time. While we are on the topic of History, lets face it, US foreign policy was not some charity - it was self interest. Documents from the period show that the Marshall Plan was aimed at keeping Europe afloat so it could buy US products and help the US avoid a post-war depression. The Marshall Aid was given with srings that kept the European economy tied to the US. I thank God for the US's contribution to both World Wars and the Cold War. I have great respect for your country and much of my job involves teaching your history to 16-18 year olds because I feel it is important that they appreciate you as well. But don't try and tell me that you did anything against your own best interest - like any country, you rightly put that first. My original point is that I hate the way some of your neo-con commentators sneer at us and make fun. We are different, but not inferior - they do not understand that. Inept Rewriting of the Past - fitting name. Forgets that Britain was for appeasing Nazism until they realized they weren't safe with this policy. Much like is advocated with the militant Muslim menace today. Ballotboy, which Neocon commentators? I feel a need to clear this up. If you're talking about the Abducted 15, I can't help you, because I agree that it was a debacle for Britain. But if you are referring to other issues, I would be interested in hearing them. JF - Kondracke, Barnes, Angle and Krauthammer to name a few. Also, before you have a go at the Abducted 15 debacle, could you tell me how many guards died defending the US embassy in Iran back in the 1970s. Equally, what about the debacle of September 11, or December 7th 1941. The US also make mistakes, but we don't mock them in the way that some commentators have done. By the way - I think the Soviets had a hand in defeating the Nazis - probably a greater role than Britain. Teddy Bear - Appeasement was needed, in part, because the French were so weak and the USA were Isolationist. Appeasenment was Realpolitik. Britain had few option because it had gone down the diarmamemnt road and then got stung by the post-1929 depression and could not pay for the weapons until the late 1930s without causing huge problems. Quite simply we could not have fought Hitler before 1939. Maybe if the USA had not ducked out of the League in 1921 (or at least have been willing to support sanctions rather than undermining them) Italy, Japan and Germany would have been less willing to flex their muscles. Maybe if the USA had helped stop Japan in Manchuria the first Sunday in December 1941 would have been a much quieter day. Thank the Lord the US has got wise to this. Ballotboy, first off many did not want the Marshall Plan because of what happend with our aid to Europe after WWI with the European econony, recession, instability etc. Our banks which are private businesses were left with some major unpaid depts and we ourselves entered into the worse depression in our history. By '47 there was little progress in Western Europe and there were signs the situation could grossly deteriate. Food was in serious shortage. It was understood millions were starving to death. And many froze to death with no coal. Our factories were on a roll and to sustain prosperity the markets would have to expand and indeed the Marshall Plan for Western Europe did make that possible. It was understood by important key figures we would be entering into a bipolar world and communist expansion could well pose a serious threat. As an American all I can say is we were darn right to take it serious and do what we could to stop it. And it was not just in our interest, but every free nation's. Don't forget too, the cold war was not yet realized and most advocating the plan were not motivated to contain Soviet expansion. Don't revise our contributions selling us out, there was humanitarian motivation. Its not like we looked over at Europe and said the hell with you. Some Americans are justifiably critical with the very cynical view of US motives whenever wherever acting purly from self-interest. And if you agree with "inept rewriting of the past" then you don't know history and who we were before WWII. Geese you've given the very distinct impression, WWII can be blamed, on us? Pathetic. Ballotboy, there was a revolution going on in Iran at the time, so it wasn't exactly feasible for 20 or so Marines to hold off several hundred Iranians while protecting the other 60 or so diplomats. Carter did nothing, but the country was outraged at his response; contrast to Blair's inaction and the UK's general apathy. The US cut diplomatic relations with Iran in 1980. The UK continues to maintain diplomatic relations. The US invaded Afghanistan in response, destroying the Taliban and occupying the country. The UK has done nothing in response to this hostage taking. To compare December 7, 1941 is even more crazy. The US fully entered WWII on the side of the Allies, crushing the Axis powers. In comparison, the UK has done nothing in response to this hostage taking. Yes, the US has made mistakes, but the US stood up for itself and took action in response to these insults. The UK, in contrast, has made weakness a virtue in order to justify its lack of response. It's hard for Americans to understand why there isn't more outrage in the UK over this, but I suppose too many years of "softly softly" tactics in the UK have ended up producing a soft nation. The Soviets did have an important role in defeating the Nazis, indeed. But at a horrific cost that would have been even more horrific if the US had not intervened. Finally, in response to your comment to Teddy Bear: the difference this time is that the US was completely willing to aid the UK, but the UK still appeased. We're all wondering why. "Our banks which are private businesses were left with some major unpaid depts and we ourselves entered into the worse depression in our history." Our banks were also private businnesses and the depression was caused by a wide range of issues, not just loans to Europe. Can I suggest that you all go down to a book store and buy some History books - you sure is in need of it. "you sure is in need of it"
And some grammar books, as well. I didn't say our depression was caused just by upaid loans to Europe, not even close. But they were both factors with the Marshall Plan considerations, amongst a number of concerns. What a lame response. And of course the typical sarcasm when you're at a dead end to address ALL points made in response yours. It's true that the U.S., like most nation states then and now, acts in its self interest. But to an extent that perhaps today's British don't realize, our perception of the world and our place in it comes from our inheritance of the language, culture and institutions of Britain. We sometimes like to think that we invented self government, an independent judiciary, resolute opposition to totalitarianism, etc. We were instrumental in pushing these things along from time to time, but they were in no samll part a gift (perhaps unintended) from the "old" country. I used to think that made us like cousins, but perhaps we're more like uncle/nephew. Members of the same extended family, usually happy to spend some time together, but relieved they don't necessarily have to live together. And disagreements tend to be transitory, without disrupting the essential relationship. Very impressive and expansive. 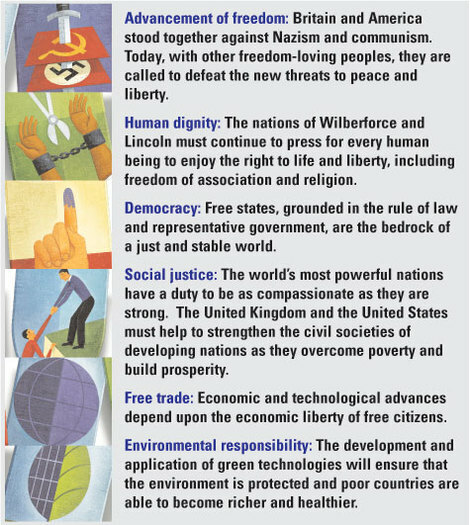 I particularly liked emphases on social justice and environmental responsibility, two crucial but underrated aspects of freedom and human dignity. One minor point. As far as democracy is concerned, it would be great for BritainandAmerica.com to insist on state-building and the reestablishment of a strong, Hobbesian sovereign force as the prerequisite for the proper liberal democracies we want to see in the world. Otherwise we run the risk of discrediting democratisation, when we leave places like Iraq as 'incomplete' democracies (which are, incidentally, far more bellicose than many autocracies). Excellent revamp, please don't ruin it by veering off into Anglospheric rhetoric. Oh, and the Marshall Plan? It is a stirring story, but the sad truth is it was mostly irrelevant. Europe didn't face a serious food shortage by 1947, and neither side of the Atlantic faced a return to the Great Depression. The United States saved the Continent between 1945-47. (As many funds were released in these two years as during the whole Plan's lifespan). No - the grammar was mocking US usage - sorry sarcasm failure. "Ballotboy, there was a revolution going on in Iran at the time, so it wasn't exactly feasible for 20 or so Marines to hold off several hundred Iranians while protecting the other 60 or so diplomats." - Yes and the 15 British sailors were also outnumbered. "Carter did nothing, but the country was outraged at his response; contrast to Blair's inaction and the UK's general apathy." Britain is not apathetic (you clearly have not been following the story over here) and don't forget the Reagan did a deal with Iran by giving them weapons to get them back. Plus Blair's response got them back short of 444 days without having to give them weapons. "The US cut diplomatic relations with Iran in 1980. The UK continues to maintain diplomatic relations." Yes and the USA uses British diplomats as a back channel. "On to September 11. That was a terrorist attack against unarmed civilians. It's outrageous that you would compare the events." The CIA goofed up on this one and you know they did. Missing this was a grave error and you know it. "To compare December 7, 1941 is even more crazy. The US fully entered WWII on the side of the Allies, crushing the Axis powers. In comparison, the UK has done nothing in response to this hostage taking." Again you miss the point - I was saying that you slipped up here and failed to see it coming. Also you Appeased Japan in the 1930s just as we did the Germans. "The UK, in contrast, has made weakness a virtue in order to justify its lack of response. It's hard for Americans to understand why there isn't more outrage in the UK over this, but I suppose too many years of "softly softly" tactics in the UK have ended up producing a soft nation." What do you suggest we do? Had we taken any military action the 15 abductees would have been killed. Maybe we should have taken resolute action like with the USS Pueblo. Or maybe a Gulf of Tonkin type reaction that gets us involved in a ten year war we lose. "The Soviets did have an important role in defeating the Nazis, indeed. But at a horrific cost that would have been even more horrific if the US had not intervened." The Soviets softened up the Nazis for three years before D-Day - If the USA had got involced in 1939 (or even before) this would not have been needed and the Cold War could also have been avoided. "Finally, in response to your comment to Teddy Bear: the difference this time is that the US was completely willing to aid the UK, but the UK still appeased. We're all wondering why." Quite frankly, the British public, like the American public, don't trust Bush on the military front. By the way, not all Americans are struggling to see why we didn't go nuclear on Iran - just the Neocons, which is where I came in. Is that better Teddy Bear? By the way Steevo really needs to try harder - he has taken a very out of date interpretation of the Marshall Plan. Try reading Geddes on this topic. Equally, the USA has to shoulder some blame for the failure of international relations in the 1930s. Anyway, off to bed now as tomorrow I have essays to grade. I feel sorry for Tim, his intent here is a nobel one. I blame much of the friction here not only on defensive ego but a manipulative self-serving ideological media and decades of negativity about America. Now the aftermath of a humiliating experience on the Brits and I think its especially hard for either nation to accept any criticism. Joseph, William Clayton reported to Washington that "millions of people are slowly starving" in '46 - '47. The reconstruction plan was developed at a meeting of the participating European states on July 12, 1947. This has gone woefully off topic intent. My apologies for my part. Every major source I've found backs it. Yeah try reading this guy Geddes so I can finally know who's responsible for WWII? Prove where I'm wrong instead of your arrogent and simplictic condensation. "Prove where I'm wrong instead of your arrogent and simplictic condensation"
It seems that you getting all steamed up - is that's whats causing the condensation. Plus, if you've not red Geddes, you should get out of the debate. Naming the Truman Library as a balanced piece of History, especially when it's the "whistlestop" tour of the Cold War shows your lack of historical understanding. The OECD link is a blind one - in more ways than one.